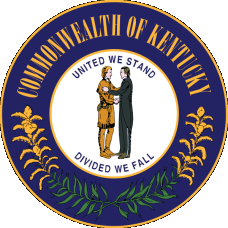 Kentucky vital records have been stored centrally since June 1958 and can be purchased from the Office of Vital Statistics in the Department for Public Health. Kentucky marriage records are available for $6 from Frankfort and for various prices from the Clerk of County Court in the county that originally issued the license. Kentucky divorce records are identical in price and availability. Kentucky vital records can be released only to the person on the record, the parent, or the legal guardian. Henry Clay, Kentucky's greatest son, was immensely influential in the early to middle nineteenth century. Along with his colleagues Daniel Webster and John C. Calhoun, he likely delayed the Civil War by a decade with the Compromise of 1850. After his death, he became the first person to lie in state in the Capitol. Counties in fifteen states were named after him. Record Access Requirements: Copies of marriage certificates prior to June 1958 may be obtained from the County Clerk in the county where the license was issued. Search Note: Must also include where marriage license was obtained and a daytime phone number. Record Access Requirements: Records of divorce proceedings are available from the Clerk of the Circuit Court that granted the decree. Search Note: Provide a daytime phone number. Note: The Administrative Office of the Courts offers a service of providing statewide criminal background checks. Record Access Requirements: The CourtNet system will send individuals being check a copy of their record and the requester's names. Agencies that employ persons with supervisory control of minors are considered Youth Requests and not required to pay a fee. Search Note: The required Release Form is available from the AOC, call the number above. Note: This agencies suggests if no signed release to use the Administrative Office of Courts in Frankfort, KY; phone 502-573-2350. Record Access Requirements: Records are available to all requesters as long as a signed release is submitted. Special forms are suggested for certain employment purposes such as nursing, schools, lottery, EMT, YMCA, daycare, and adoptive/foster parent background searches. Search Note: Certain authorized searches require fingerprints to be submitted. Request forms may be downloaded from the webpage. Statistical information about criminal offenses and accidents is available from 1971 on. Search Note: Location, physical identifiers, conviction and sentencing information, and release dates are reported.